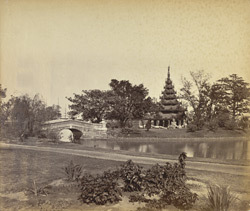 Photograph of Burmese Pagoda in Eden Gardens, Calcutta from the Album of Miscellaneous views in India taken in the 1860s. Eden Gardens, situated at the northern end of the Maidan, in Calcutta, was named after Emily and Fanny Eden, the sisters of Lord Auckland, Governor-General from 1836-1842. The sisters tended the garden when it formed part of the Viceroy's estate and later it became a famous public garden, opened in 1840. Part of the garden forms the Ranji Stadium where the first cricket match was played in 1864; today Eden Gardens is renowned as a cricket stadium. Eden Gardens also contains a Pagoda, brought from Prome in Burma after the Second Burmese War and erected in 1856, by Lord Dalhousie, then the Governor-General. This is a view in the Eden Gardens, looking across the stone bridge towards the pagoda.